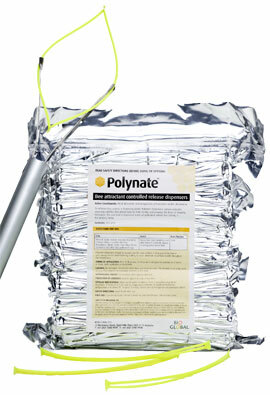 Polynate is a dispensing technology used to enhance bee activity in flowering plants such as fruit and vegetable crops where bee activity is the limiting factor. Polynate dispensers release honey-bee and native bee attractants throughout the crop-flowering and bee pollination period. Polynate dispensers last for the total bee pollination period from 6-8 weeks. A single application prior to bloom can help growers manage bee activity which can result in better pollination and uniformity of fruit. Fluoro yellow fade-straps to indicate age and aid visibility in trees. Dispenser-strap feature to allow quick and easy application to trees. 500 dispensers per pack for fast calculation. Field life that times in with crop flowering. Rain resistant – not affected by rainfall, overhead irrigation or over-tree cooling.